And so while the kids are still adjusting to the time change here in Hawaii (we’ve been up since 3:45 a.m. this morning), here’s a recipe that’s close to my heart. 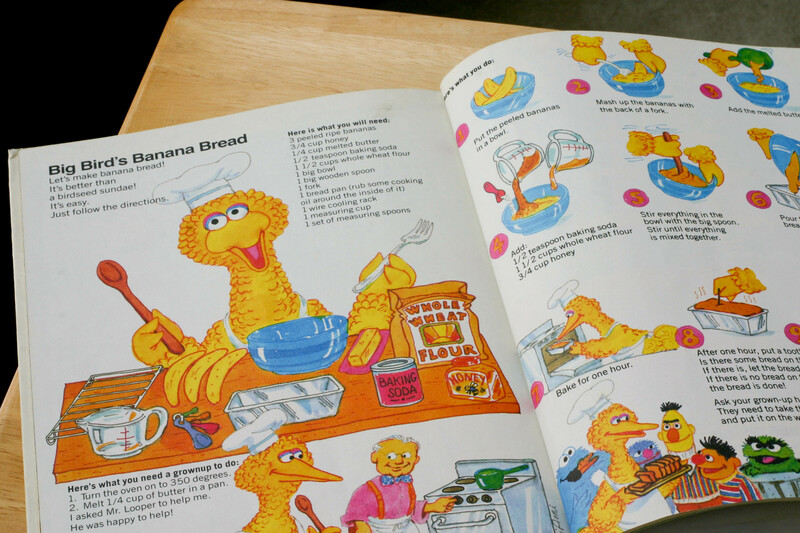 Big Bird’s Banana Bread is a recipe from The Sesame Street Library books that came out in 1977. These books were a favorite of mine as a child, but were ruined in a flood many years ago. Fortunately, when Mr. N was born I was able to find the complete set on eBay. 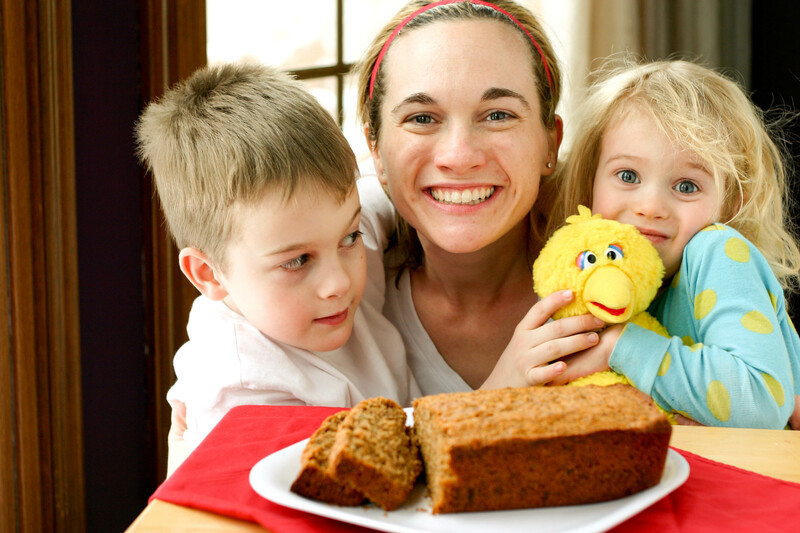 Since then, I’ve been waiting for the day my kids would be old enough to make their very own Big Bird Banana Bread. 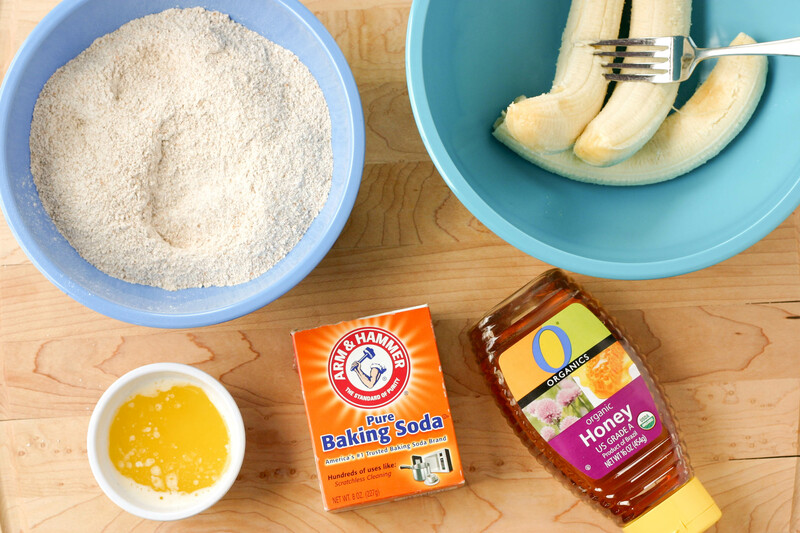 Then we gathered our ingredients: bananas, baking soda, honey, whole wheat flour and melted butter. Mr. N first mashed up our bananas. 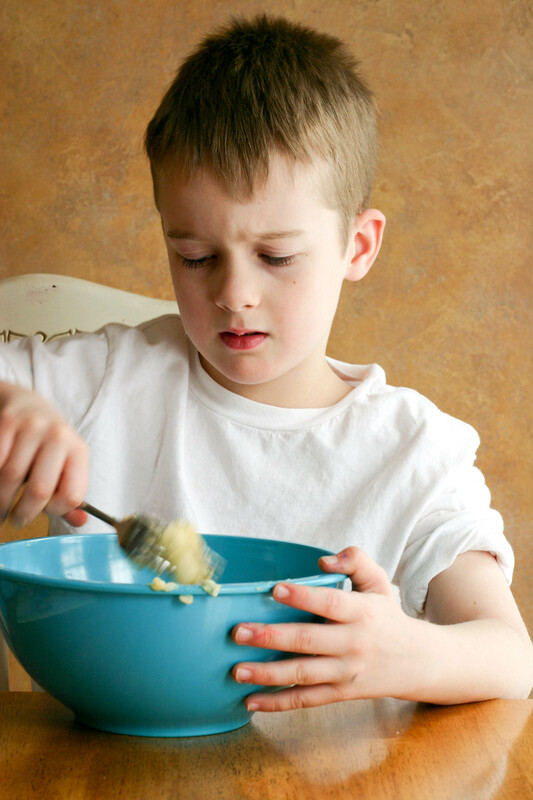 He then read Miss A the next step in the recipe (I really just sat back and let the kids cook this one. 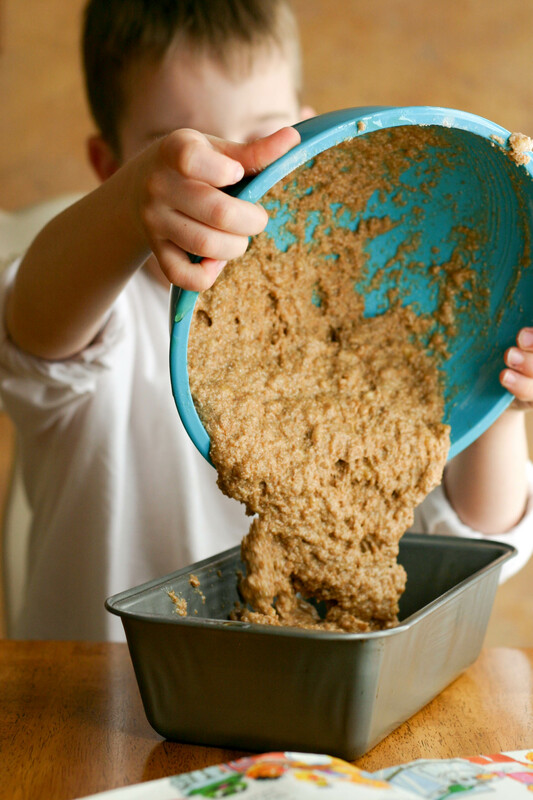 After 12 other banana bread recipes – I think they’re ready). 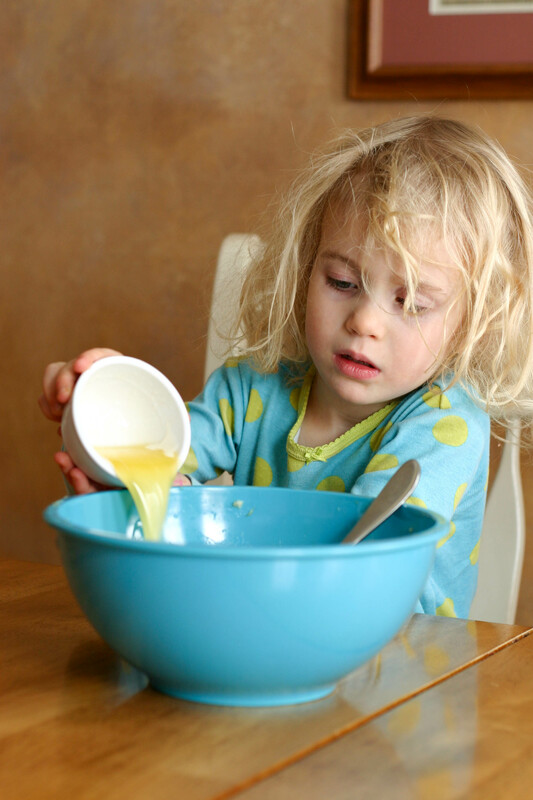 Miss A poured the melted butter into the mashed bananas and Mr. N mixed it together. 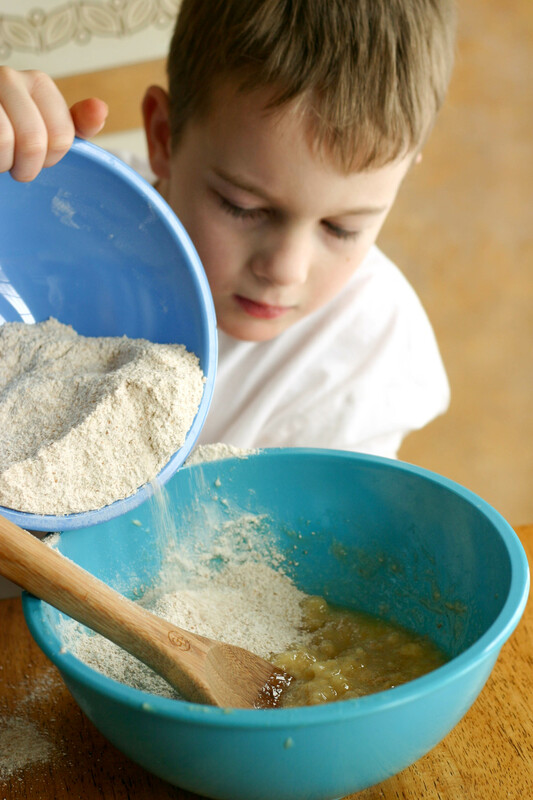 Next he added the whole wheat flour and baking soda. Miss A supervised the mixing efforts. 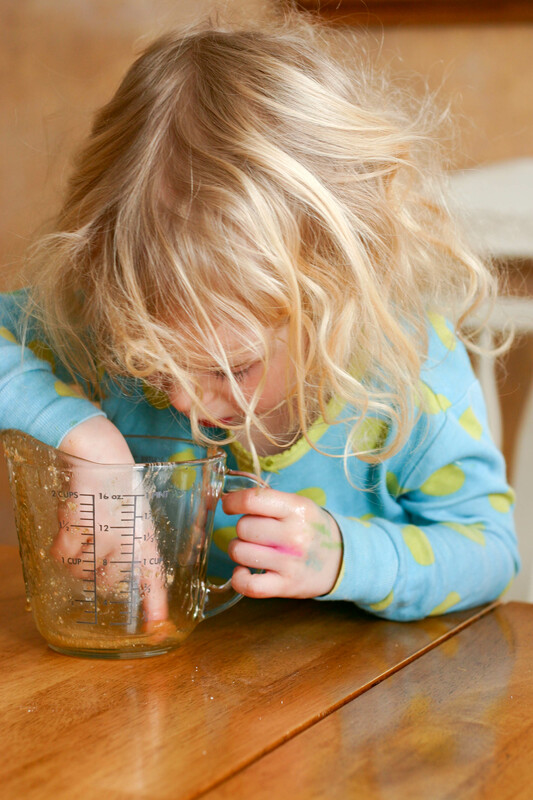 Then she added the honey – 3/4 of a cup (remember there’s no sugar in this recipe). while Miss A was busy cleaning up her honey. The batter was fairly thick since there’s no oil and a bit more coarse than our other recipes. The bread bakes at 350F for one hour. The kids had some fun with big bird while they waited…and requested I take a picture for the blog. They were cracking themselves up. What you don’t see in this picture is the kids hiding under the table giggling up a storm and pretending to be big bird. The bread was finished right at the hour mark, smelled wonderful and was a beautiful, crusty and golden brown. We let the bread cool for about 10 minutes and then dug in. It was warm and full of delicious banana bread flavor. 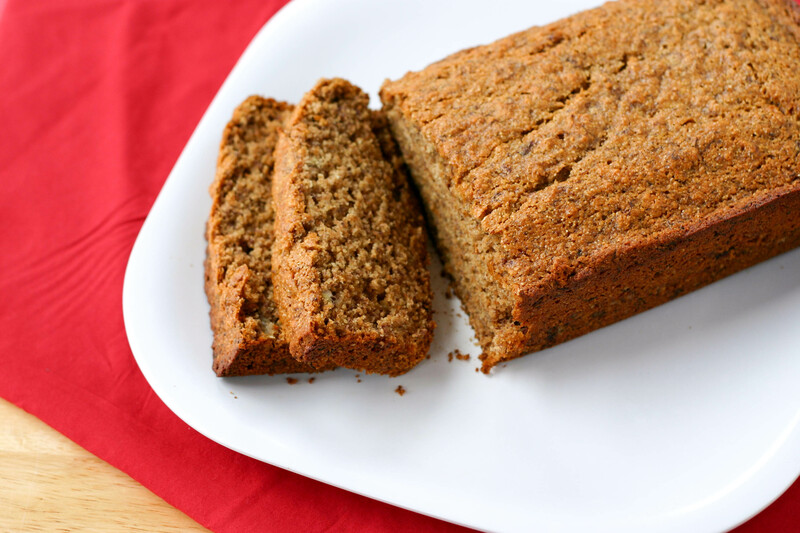 This recipe isn’t as sweet as some of the other breads we’ve made, but surprisingly met rave reviews from our resident sugar junkie, Miss A. Mr. N often divides his review into two parts – crust and middle. For the Big Bird recipe, he didn’t really care for the crust, but liked the middle. Mike and I both liked the banana bread, but didn’t think it would end up as one of our favorites in the showdown. That said, even if it doesn’t win the contest – it’s still really the best in my books dad. 😉 And besides we know it’s better than a bird seed sundae! 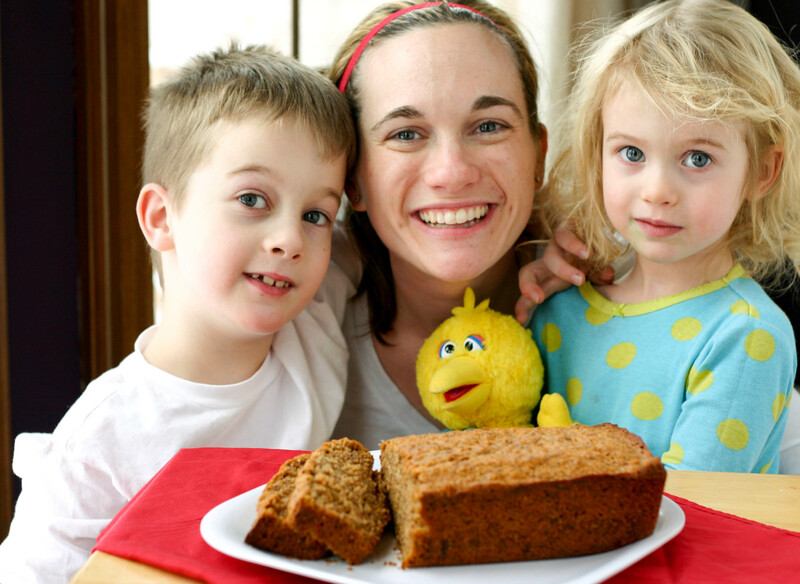 The kids had a blast making the Big Bird banana bread and it was a joy to watch them. In fact, this whole banana bread quest has been a fun experience. We got to learn a lot, spend quality time together, get to taste lots of fabulous banana bread recipes, and most importantly made dozens of memories that I’ll cherish for years to come. I have a feeling that these memories will be among those that I think back to as the kids get older. Now before we head out to watch the sunrise over the ocean (there are some benefits to rising this early), we’ll leave you with this…The taste test results are in from the final showdown! Who do you think took the prize? Stay tuned and have a great weekend! I have saved this book from my childhood. It sits in the cupboard with my recipe book. This is the only recipe I use for banana bread. I love it & so does my family. I have used regular flour & also substituted sugar for honey when I didn’t have honey available. It always turns out great either way. Thank you for sharing & for the pictures they’re very cute. Thank you, thank you for this recipe. It’s been almost 20 years ago I read this from my home’s library. Nostalgic! 🙂 It’s a great trip down memory lane isn’t it?! This is the cutest post ever, Kristy!! 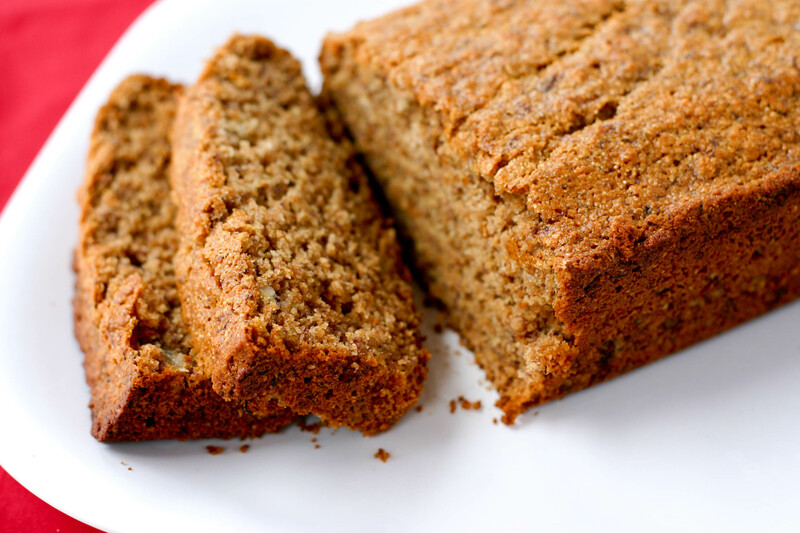 And I cannot get enough banana bread these days: addicted! I have the Sesame Street song playing in my head now! Hehe LOVE the photos – and the banana bread treasure hunt. Enjoy Hawaii, and kisses to Miss A and Mr N! These are best, happiest pictures and they make me so happy! I appreciate you sharing the pure joy of this banana bread experience. I hope you know how lucky your children are to have you. It’s obvious how much zest you have for life and how much love you have for your kids. Their beautiful happy faces are proof. And here I thought you were in Hawaii.. enjoying the sun.. which is why I didn’t even pay attention to my subscriber email until today LOL. I LOVE this post. You guys are such a wonderful family. And you know how I am about bread, so I probably can’t say anything too profound lol. But it looks like you guys did a wonderful job with it. It looks amazingly moist too. Have loads of fun on your vacay! yep! Looks like the best banana bread to me! You three are so cute in that picture! Love it! Congrats on finding the ONE! Now I must make IT! Oh my gosh, this is the most adorable post I’ve ever seen. Such a cute idea to cook out of the book! 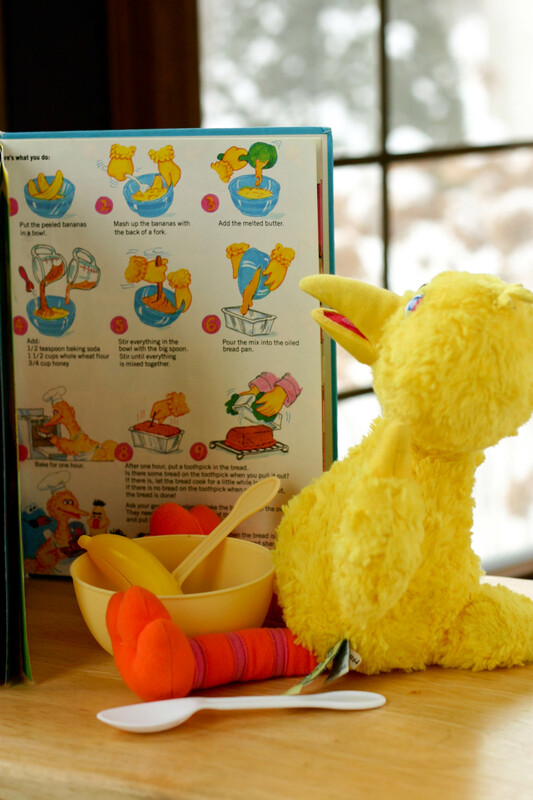 My brother was obsessed with Big Bird when he was little (and loves to cook)…if only he knew about this book then, haha. Congrats on the last banana bread recipe. I can’t waaiiit to see which one wins! You’ve made so many fantastic recipes. It’s gonna be a tough choice, I’m sure. Hope you’re having a great time in Hawaii!!! Enjoyed from beginning to end. Oh boy, I cannot believe this is the last “test” recipe! Can’t wait to see which recipe wins! I love all these photos..Big Bird included!! This has been one fun banana bread making journey! I can’t wait to see the winner. I think I’m as excited as your kids must be!! Everything tastes better when there is a special story behind it. 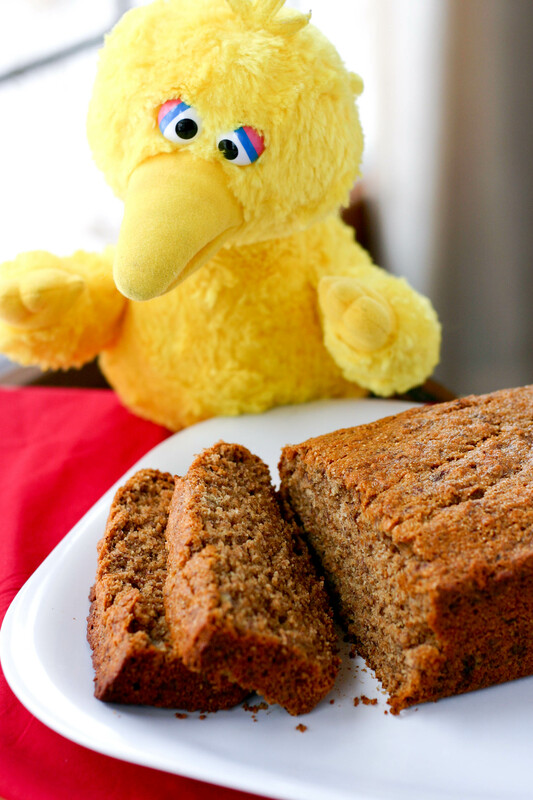 I’m sure that the kids on the playground will all be talking about big bird banana bread now! 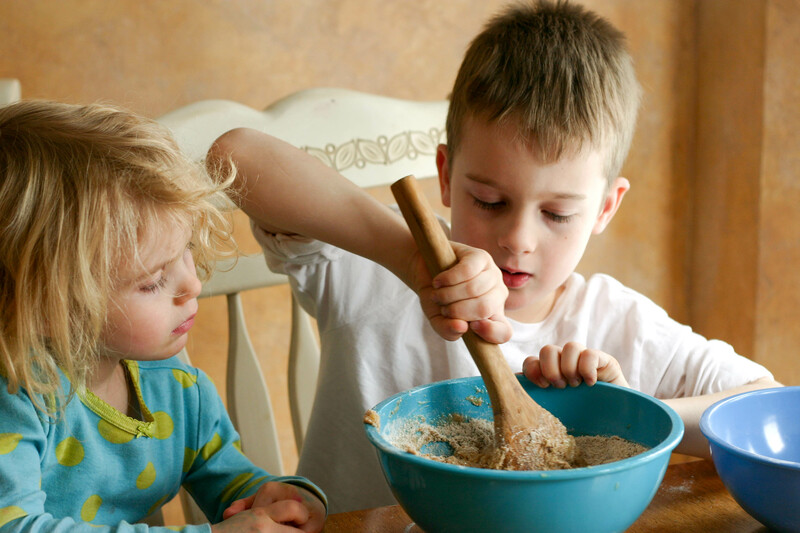 I think that getting our kids involved in the kitchen, and making it meaningful with stories like these is the best gift that you can give your kids. Good on ya Kristy! What lovely photos of you and the kids Kristy. I am very envious of your trip and being able to watch the sun rise on the ocean…I can just smell the ocean now. I’m hoping you will have some photos to post of your fabulous holiday! Those pictures are seriously priceless!! 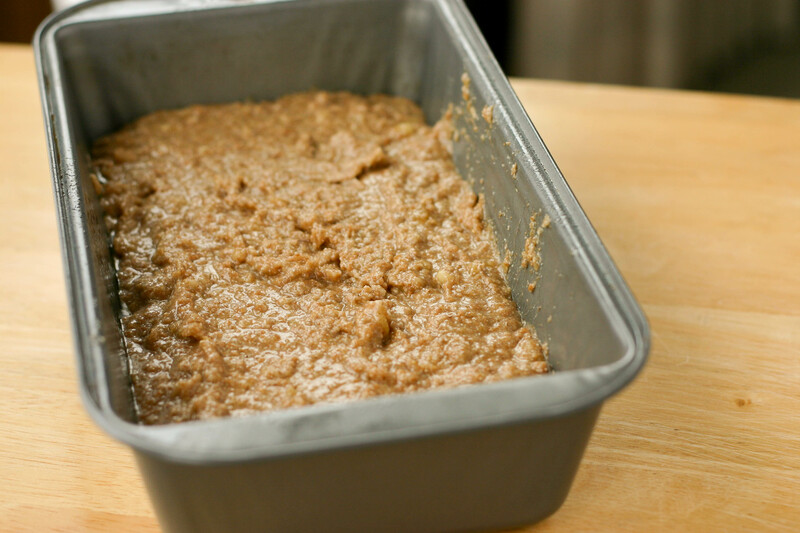 I can’t wait to hear the results – I need a new, wonderful banana bread recipe! How adorable!! I love your connection to the recipe, and you must have been so happy to find the books!! I had no idea that Big Bird had his own banana bread! 🙂 Can’t wait to see which recipe wins! Have a wonderful time in Hawaii!!!! Beyond happy Stefanie! I never thought I’d see those books again. But from the time Mr. N was born, I was on a mission. 😉 Thanks for the well-wishes. We’re definitely having a great time so far. Have a good weekend! The result day was a hoot! I’m still full…and honestly I’ve never seen Miss A eat so much as she did that day! Wonderful post, Kristy. What better way is there to end the contest than with your SousChefs taking center stage? Speaking of your contest ending, you probably haven’t watched CNN. Apparently, your announcement ending the contest has has sent shockwaves throughout the World’s banana plantations. Analysts fear heavy lay-offs to follow as far fewer bananas will be in demand. Maybe you should consider baking one or 2 breads each week. You could always send one of them here. You know, for the good of banana pickers the World over. LOL! 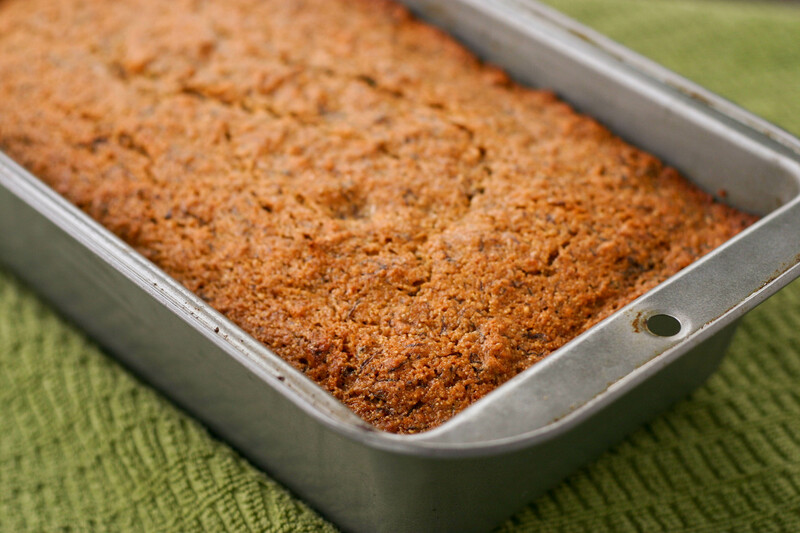 Not to worry – I’m sure we’ll be making banana breads on a regular basis still. (We just won’t be posting them.) And John, I’m more than happy to send you banana breads…wouldn’t mind one of your pasta dinners in exchange. 😉 Hope you have a great weekend! Loved reading your comment…made me laugh today! Kristy, this is just the sweetest post ever. I absolutely love Big Bird and all the photos and the image of Mr. N And Miss A giggling under the table… Sesame Street brings back so many memories… :). What a great quest – so much fun to see all the different breads and participate along with you. The honey sounds really nice in this one! Looking forward to your final views and reviews ;-). We most certainly are Kelly! 🙂 Thanks! Can’t wait to see the winner! Miss A’s hair is even wilder than normal. Katherine was just laughing in the that’s adorable way! LOL! Gotta love her bedhead look! 😉 You should see how curly it is in the humidity here. You’d think she had a haircut it’s all so tightly wound and curly. Okay, now that I’ve heard the story behind the quest, I love it even more!! 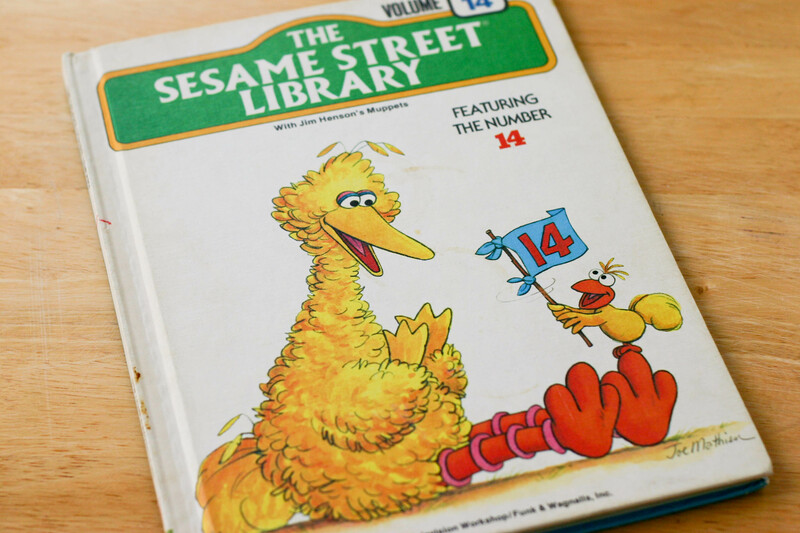 I totally had the Sesame Street Library growing up, too!!! (Wow, going a little crazy with the exclamation points this morning.) Anyways, I never made the banana bread, but I totally remember the books. 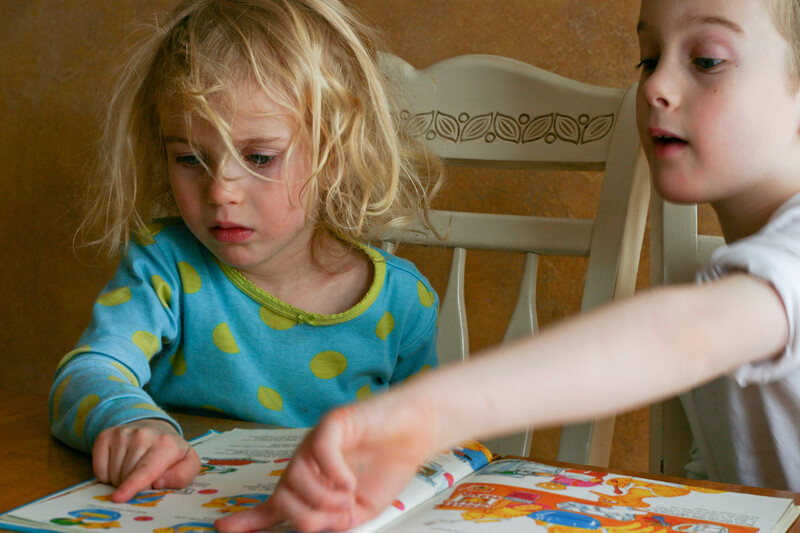 Isn’t it fun to share your favorite childhood memories/things with your kids? 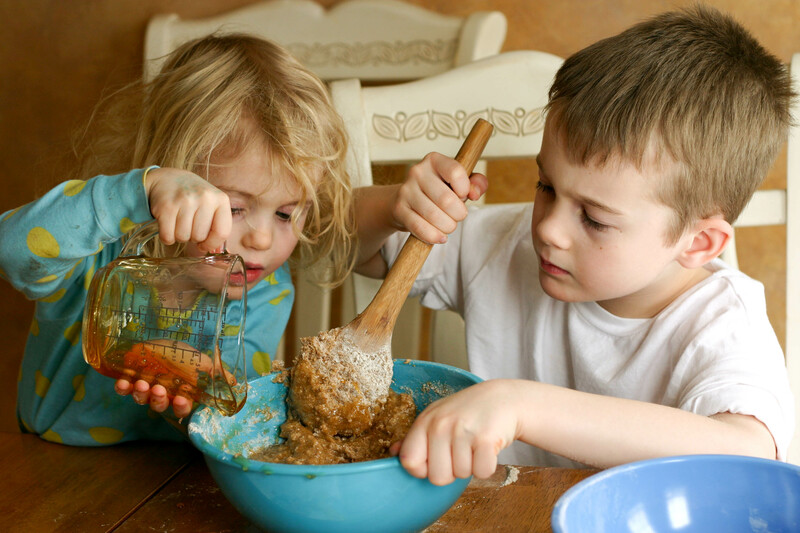 It looks like they’re quite the banana bread pros – and I can not wait to hear which one won. Enjoy Hawaii!! (I know, it will be so hard.) Hugs to you Kristy! Thanks Courtney! And don’t worry – I’m always exclamation point crazy! 🙂 LOL. Love it! You and the kids are so beautiful and Big Bird too! lol No matter what recipe wins, personally I think this one is the best b/c of the love you all put into it.